Angora and wool - gifted by Jane the Cheese. So far, so good. Lovely and toasty! As predicted, a short delivery day today and the traffic was thankfully very light driving up to South London and back. My furthest delivery spot is Franklins Farm Shop in East Dulwich - a small but VERY nicely appointed shop that specialises in seasonal and British produce, sourced as locally as possible. It's always a job to find somewhere to park nearby and I have had several run-ins with the local parking attendant. However, so far, he has been a very nice man and let me off both times he has caught me parking on a double yellow. But I figure that I can't push it too much and so recently I have been driving round and round in an effort to find a legal space! Today I was lucky and managed to park right in front of Franklins, so I thought I would take the opportunity to buy my fruit and veg in there, as I haven't got the luxury of my farmers markets this weekend. 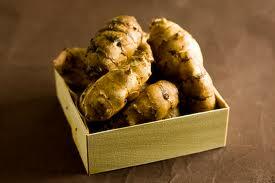 So, what do you do with a Jerusalem artichoke?? They always catch my eye but I have never been sure what I could do with them.. Grasping the bull by the horns, I bought a handful today and have luckily found a recipe for artichoke and chicory gratin .. sounds yummy, so will give that a whirl over the weekend. If the pregnant ladies do not dry themselves off ready for kidding, we have to encourage them to stop producing milk so that all their energy is channelled into making themselves and their kids strong. We try and dry them off at least 8 weeks prior to kidding and so are now starting to look at the early deliveries. Some have dried off already (Foxglove and Footsie always get lazy in the winter and prefer to lie about eating hay rather than coming into the parlour for milking!) and others are well on their way to being dry. Those who have been dry for a while automatically move to the non-milking side of the barn at milking time but the 'newly dry' are not yet in the habit and have to be moved across by the humans. As milking time can be rather busy, the best way to identify your goats is to spray a red mark on their backside so that you can spot them from a distance and separate them off. Here's Moonstar sporting a red rump - not very glamorous but it helps the humans! 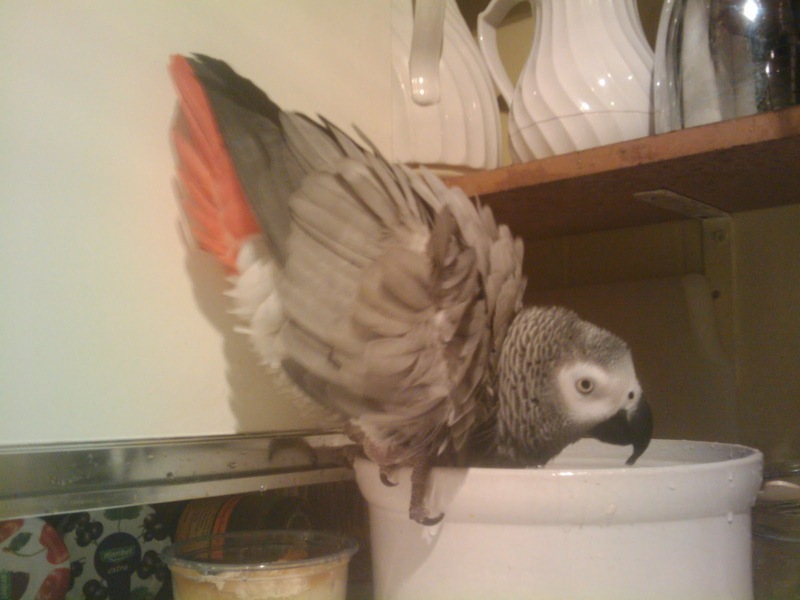 Seems that Sara was so impressed with our Ellie's blog that she has decided GeeGee parrot should have one too. GeeGee has many friends and admirers, not least in Sara's office, and so it is only natural that everyone would want to read about her. So, if you fancy a change from goats, go to http://www.geegeeparrot.blogspot.com/ to read GeeGee's Parrot Tales. Very entertaining they are too .. 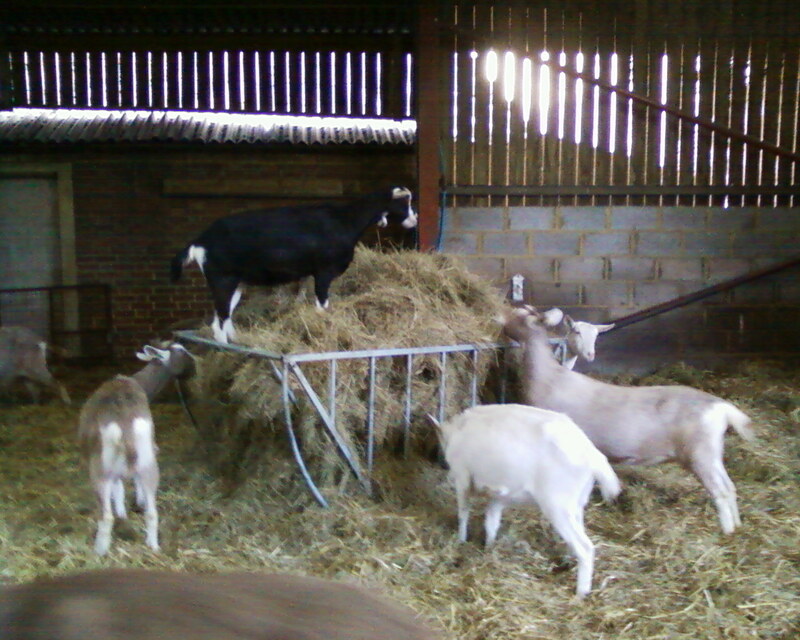 In the world of goats it was a relatively uneventful day apart from the two HUGE bales of new straw that were rolled into the milkers pen this morning. The weather was threatening to be a bit rubbish today and so the girls were showing absolutely no signs of wanting to go outside at all. 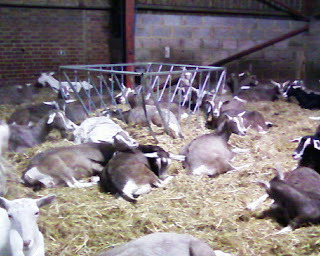 When I looked in later during the morning there were a lot of very comfy looking goats just lazing around in their new beds! 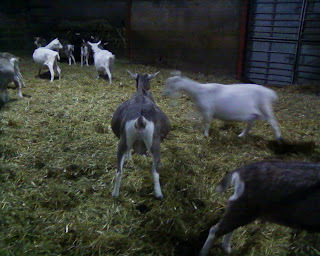 They were certainly very glad of it after milking tonight when we had a sudden storm of gale force winds and sleet, just as the last two goats came out of the parlour. I've never seen Minnie and BammBamm move so quickly! Down the ramp, across the barn and in through the gate so fast it made everyone else jump and snort with surprise. 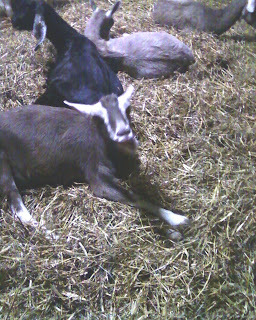 I braved the elements to shut all the gates quickly and then we were all snuggly and warm for the night. Tomorrow will be a short delivery day as many of the farm shops are still closed - gives us a chance to (hopefully) build up some cheese stocks in time for markets later in January when the milk yield is really going down! 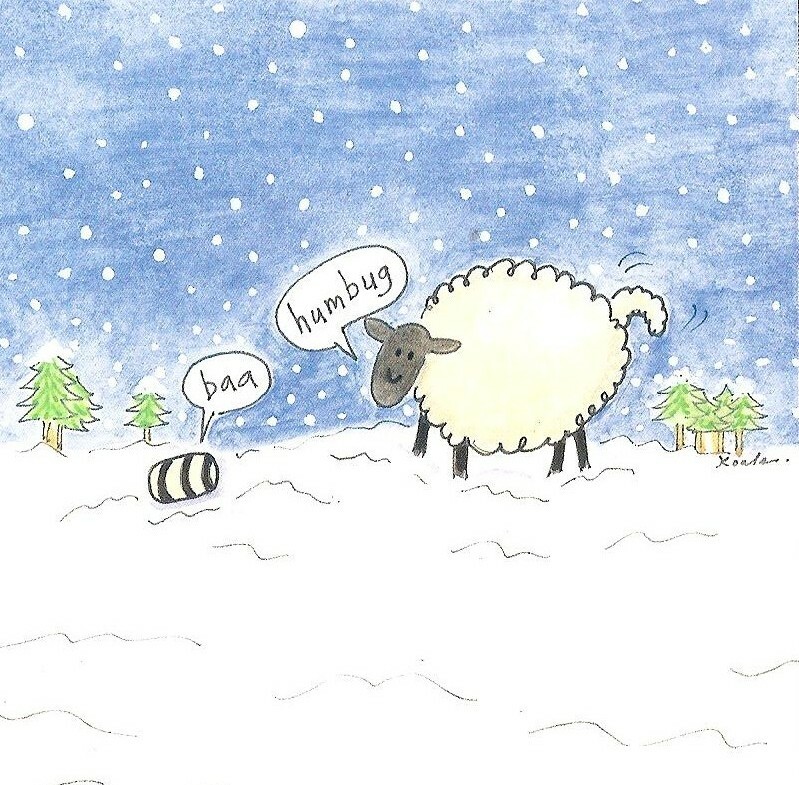 A very Merry Xmas to everyone! Hope you all had a good day. Our day, as usual, started early with milking and feeding all the animals. However, milking on Xmas day does involve a little more alcohol than usual and here is David enjoying a healthy breakfast of Bucks Fizz and Russian Honey Cake. Just what you need at 5.30am on Xmas morning. Note Bucks Fizz elegantly served in mugs! Then it was time to go and see the youngsters again and fill their hay racks. Back to the farm and milking and feeding all over again! Evening milking at Xmas is similar to morning milking in that it also involves alcohol. As we had to do a bit of driving about during the afternoon, we didn't really drink at lunchtime and saved most of our very nice bottle of 2007 Barolo for the evening. Seems that David may have had a little too much of it though as he seemed not to be entirely in control of his milking clusters .. Note the cross-over. And the best Xmas text message received this morning from Carla at Winterdale Cheesemakers; 'Thank you for making Xmas morning so believable. The reindeer s**t worked a treat!'. Explanation ... they have two young children (4 and 6) and, like many parents, set up their lounge as if Father Xmas had been to visit during the night. I supplied a small bag of fresh goat poo (the nice dry pellet variety) which they sprinkled liberally around their new lounge carpet to simulate reindeer poo. Obviously worked well!! Maybe I've found a gap in the market - we could start bagging it up and selling it for next year. Back to normal tomorrow as I am off to spend the day making cheese. After the scanning last week, we were left with 7 girls who were not showing as being pregnant. A further problem was that none of them were coming into season either ... the hormones had all gone a bit wrong somewhere. In this situation, the only way to get things back on track is a small hormone injection which kicks their systems into action. Many people ask if we use hormones or antibiotics - they are referring to the routine use of these, sometimes in feed, which can be commonplace in some cattle dairy herds. Our answer is always a firm 'no' but with the caveat that although we don't use either routinely, there are certain specific situations when they are required and necessary. This is one such situation. 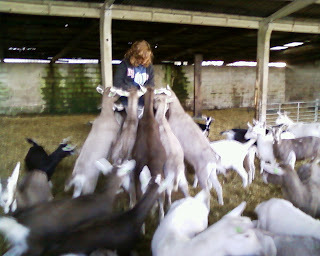 We injected the girls yesterday morning and so, this morning, there were a number of semi-waggy tails and bleating goats. To help nature take its course, we penned all the 7 girls into one large area and then set young Navajo to work. An early unexpected Xmas present for him! He has great attention to detail and is very thorough in his work - he just loves being in with those ladies! This picture was taken earlier in the year when he was clean! I will try and get a photo of him tomorrow with his harem. I had forgotten how tall he is until I was walking him round to the girls this morning and realised that the top of his head was almost level with my shoulder (and I'm 5ft 10in). And he's not fully grown yet either. Although it's December, the mild weather has meant that the Gracie Moos (David's pet cows!) are still outside. All the farmers are leaving their animals out grazing as long as possible as everyone is short on hay and winter feed this year. Sussex cattle are a particularly hardy breed anyway, but we do bring the pampered Gracie Moos into the yard for the winter. We have recently taken on some new ground not far away from the farm and David moved the cows over there last week to give them some new grass. 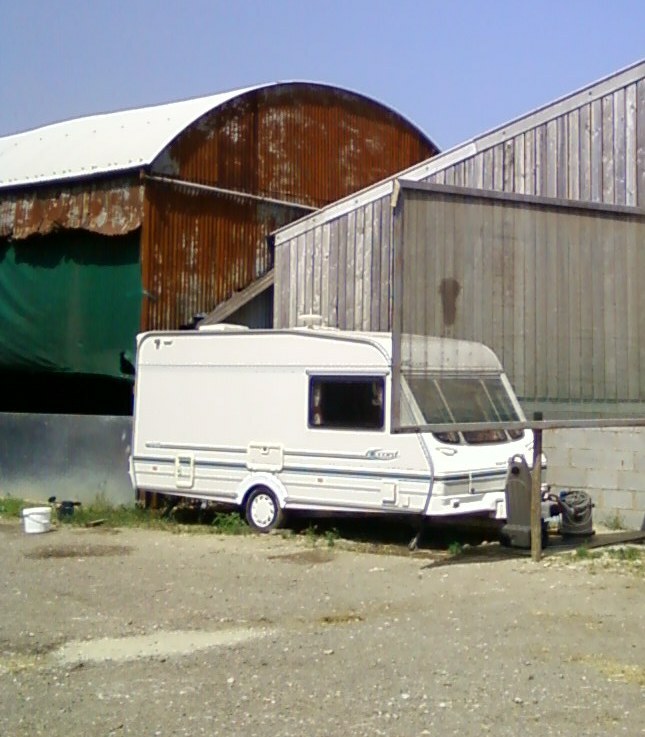 They now have a HUGE 18 acre field to trot about in! David or his dad go over there every day to check on them and so they are used to human contact. As soon as they spot a human at their gate, there is a chorus of mooing and a sound like thunder as they all gallop across the field. And here they are, several tons of beef approaching at speed! And those cute little calves have grown! Solid little people. And boy, can they run fast! And just to give you some idea of just how much space they have now - those little dots in the centre of the picture are the Gracie Moos! I don't know how much longer they will stay outside - just depends on what the weather does over the next few weeks. Tomorrow I have to go and do some more deliveries to shops that have sold everything I delivered on Friday! And then it's up to Dargate to visit the Cheesemakers of Canterbury Open Day. If you are in Kent and have the time and inclination - Jane has opened up the cheese plant at Dargate for 3 days so that visitors can come and see cheese being made. We also have a number of other local producers selling their delicious produce including Rough Old Wife cider with their stunning warmed spiced cider. Warms the parts other ciders cannot reach! Well, the Radio 4 weatherman was correct - we did have snow yesterday morning. When I got up it was actually relatively mild and a bit drizzly. A good way into milking, the temperature suddenly dropped and it started to snow. We had a pretty good covering that lasted most of the day up here on the Downs - enough to be annoying but not enough to build a snowman. As I went out delivering, it looked like places lower down hadn't really had anything at all. The market was buzzing today and we were pretty busy for the whole morning. I am back there next Saturday on Xmas Eve and I think I will be very busy sorting out last minute cheese for everyone. Today we had a visit from Paddy the Donkey. He comes to Wye every Xmas market and sells mistletoe for charity. Last year the weather was so bad that his owner could not get out of her property and so he missed the market. Today however, he was in fine form. He is such a gentle creature - he just stands and lets everyone stroke him and children sit on him. Faversham Mission Brass Band did a sterling job of keeping everyone entertained with their brilliant festive tunes and I have to say that they did sport an excellent selection of silly hats. Obviously, not as silly as my own, but there was some stiff competition there. And what of the reindeer? Well, that was provided by the Wife of Bath. Not in person, you understand .. the luscious restaurant in Wye. They have a stall on the 3rd Saturday of each month when they sell the most wonderful quiches and cakes and yummy bits and pieces. Today, Robert the chef had obviously been in the festive mood when he was making little chocolate cakes .. Tomorrow - no markets for me but Jane will be very busy (hopefully) at Whitstable whilst other members of the Cheesemakers of Canterbury team will be at Cliftonville market. Another mad week ahead in the run up to Xmas and then it will all be over for another year! 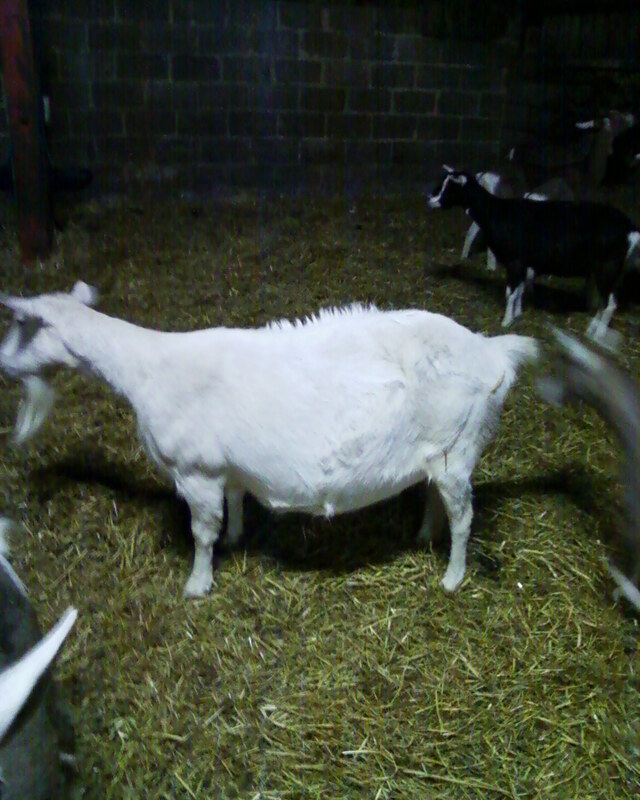 And here she is, Moyra goat. Due to kick off the kidding season in 2012. She is a pretty huge goat at the best of times but is now getting quite 'portly' and still has just over 2 months to go. We have a daughter from her already - Cristal - and a granddaughter, Minerva, born this year. Moyra also has a twin sister Meryl, who is quite a lot smaller than her, but with a much longer beard!! And just how many goatlings can you fit in a hayrack? 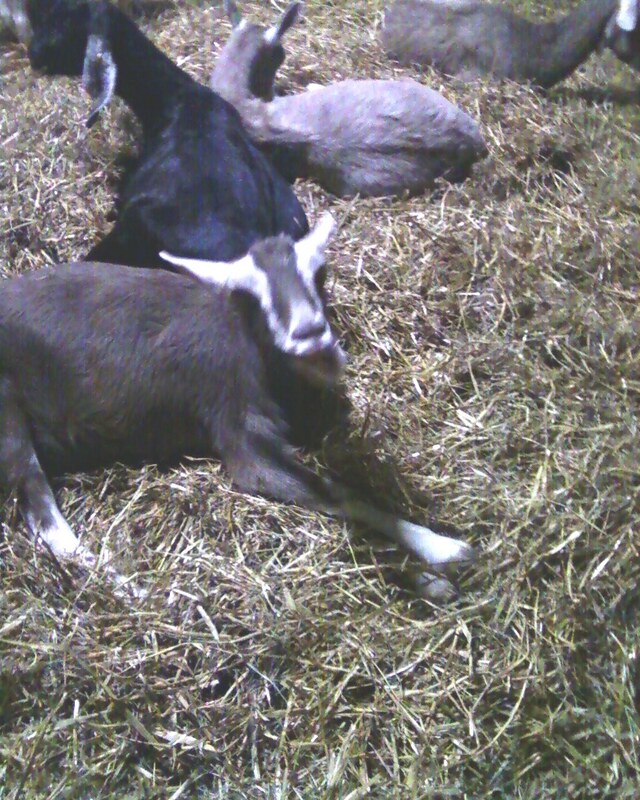 Taken on my phone when I walked into the barn this morning, so not the best quality, but there are actually 3 goatlings curled up in there! As you can see, everyone else looked pretty comfy as well. Spent the day making cheese again today. Why does Xmas come when the milk yield drops and we don't have enough cheese to go round! It's a constant juggling act at this time of year to try and keep everyone happy. Priority is always given to the bottled raw milk customers and so cheese has to be made whenever we have enough milk left. If I ever get to be Queen, I shall move Xmas to the peak milk production time of the year - round about June/July should do nicely. As well as making the cheese, I also have to do a bit of Blue Peter with it this time of year and make some gift boxes for Xmas. 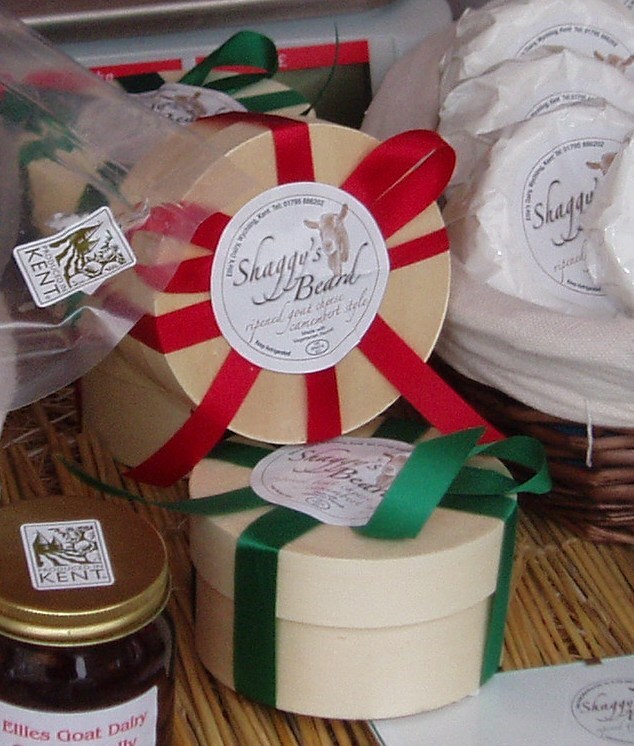 The Shaggy's Beard camembert always goes down well in the nice little wooden boxes. 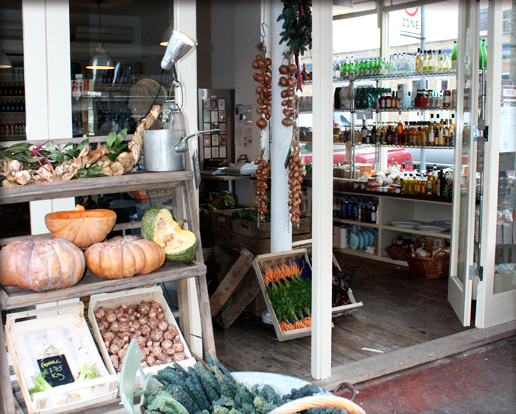 A busy few days ahead now with deliveries and markets. This time last year we were battling the elements with the snow and the Radio 4 weather forecast this afternoon was promising a little snow for tomorrow morning. We shall see what the morning brings ..
Looks like all my boys have done their jobs again this season and everyone is going to be a daddy, including our new little men Bramling and Caffrey. Well done boys! I was particularly thrilled that Fremlin is going to be a dad again - I wasn't sure that he was up to the job this year, given the problems he has had with his back legs, but seems that I underestimated the old chap! Michael came and scanned all the pregnant ladies this morning and it looks like we have over 120 kids due at the moment, with a few girls still to be scanned and confirmed in a few weeks. When scanning the goats, Michael wears a backpack which holds the equipment and a set of special glasses in which he can see the scanned image. The scanning head is run under the goat's stomach - there is no internal work like you get with cows! When he is working in the field and scanning hundreds of sheep, he views the images on a large TV screen instead as it is easier and much quicker when dealing with large numbers. Michael is very experienced and can tell us how many days pregnant the goat is, how many kids she has and whether they are viable or not. Occasionally, for example, he will say that he can see 2 kids but 1 looks like it may be having problems. We then know to keep an eye on that goat and we can also have her rescanned a few weeks later. So, our big stroppy white girl Moyra will kick off the 2012 kidding season on 28 February or whenever she decides that the time is right. She will be closely followed by several more within a few days and then we get really busy towards the middle of March. So far, noone has been scanned for quads this year but we do have 5 sets of triplets due. I was also delighted that some of our older girls are in kid - Flora, Betty and Wilma will all be 8 years old next year and Tammy (at 9 years old) is also due to have twins. This may possibly be the last time that these girls will be kidded but we will see how they all get on next year. And Ginger goat? Triplets. Do you think that will stop her trying to climb over gates and squeeze through gaps? Probably not. All I seemed to have done over the past few days is to load and unload my van with boxes and cheese and gazebos and all the other assorted paraphernalia required for markets and deliveries! My poor little van is quite worn out! Saturday in Balham was a beautiful but freezing cold day - pretty quiet though, as I think everyone was out doing their Xmas gift shopping rather than buying cheese. Not a bad day but certainly not as good as the last market in November. I expect that next weekend will be much busier, but I won't be there to enjoy it! Lenham market today was wet and cold and also fairly quiet but those customers who did venture out were spending, so that was good. A country dancing team came along and gave a short performance - myself and a couple of the other stallholders joined in. Great way to keep the feet warm. Sadly no photos though ..
Just a few more markets left for me now before Xmas - guest appearance this Thursday at the Charing W.I. market. I did it a couple of months ago for a Food Festival that was going on in the village. Seems that everyone enjoyed our cheese so much that they have invited us back for the pre-Xmas market. Always a nice cup of tea and a bit of cake at the W.I. functions! Milking tonight was largely uneventful, apart from a surprise appearance from Peaches goatling. She was obviously too busy eating hay when we split off the milkers at the start of milking and so ended up being left behind, instead of moving across to eat with the rest of the goatlings. As the last milkers came into the parlour she was left on her own and so started to complain very loudly about it. We managed to coax her into the parlour and so here she is enjoying her tea in very unfamiliar surroundings! What a brave goat she is! It does the goatlings no harm at all to come through the parlour from time to time - they get used to the machinery and the noise and so it's not so stressful and strange for them when they become milkers and have to do it for real! Everyone is in for a busy morning tomorrow as the scanning man is coming to check out all our (hopefully) pregnant ladies. My last job for tonight is to sort out my list of girls with their possible due dates so that we can cross-check with what the scanner shows. Full report tomorrow night! Remember Ginger, the goat who likes to climb over the gates? Well, since David mucked out a couple of weeks ago, she has been a bit miffed. 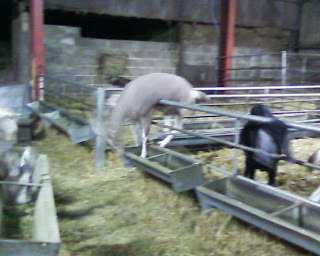 As the straw level went down, so the corresponding gate level went up and poor Ginger can no longer quite reach over. David was pleased that he had put a stop to her naughtiness but, as I suspected, she was just biding her time before she found another interesting way to wind him up. Last night we had Ginger in the parlour 3 times. The second time, I thought that my goat recognition ability had failed me and that it must have been a different goat that had already been in. Strange that she didn't have a lot of milk though, but nothing really unusual as Ginger is a 'maiden milker' and so doesn't produce enormous amounts. However, when she appeared for a third time, along with several other goats who seemed already to have been milked, we realised that something was not quite right. As the goats left the parlour and went down the ramp, David went outside to watch what was going on. Sure enough, young Ginger goat pushed against the gates at the bottom of the ramp and let herself back into the 'milking' side of the barn. Then she ran along to the parlour entrance gate and stood waiting to come in. Again. Swearing under his breath and armed with various implements, David secured the gates in position thinking that would put an end to it. And so, to milking this morning. Ginger came in and went out with the other goats. As predicted, she pushed against the bottom gates but found, to her disgust, that she could no longer move them. David smiled smugly and came back into the parlour. As he opened the entrance gate, there was Ginger waiting for him! Not to be deterred by an immoveable object, she had jumped over the gate and let herself back in again anyway!! David knows when he is beaten .. I think he has given up any hope of ever keeping Ginger in where he wants her. Last night David loaded another enormous bale of straw into the milkers pen just before bedtime so that they would be nice and snuggly for the night. They also got a whole new enormous bale of hay. 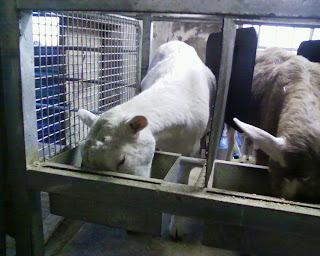 After milking, they just didn't know what to eat first! 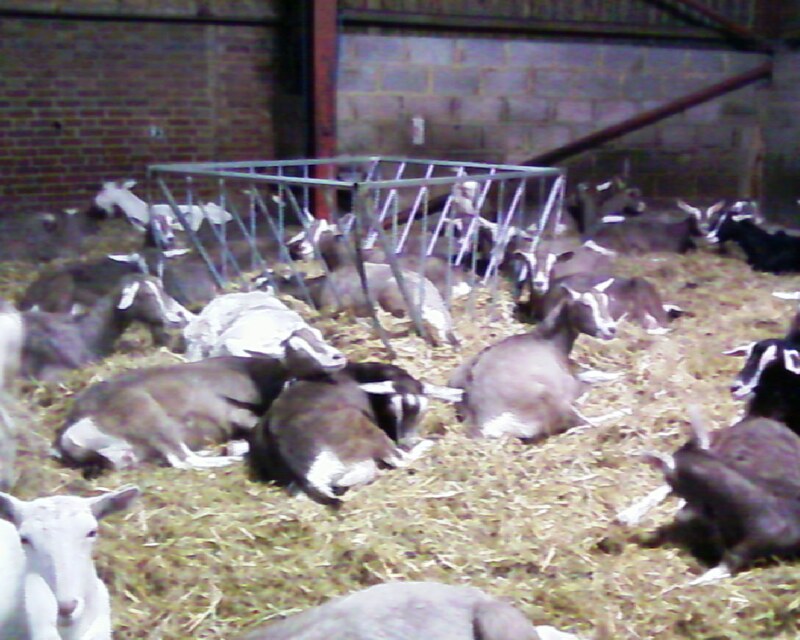 So, this morning when I switched the light on, there were a lot of very contented and very lazy goats lying around all over the place - not a single one was standing up! I managed to snap a picture of Poppin as she woke up - note the front legs crossed and the yawn! 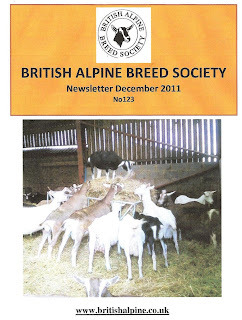 I sent one of the earlier photos of a black goat climbing in the hayrack off to the British Alpine Breed Society just out of interest. Imagine my surprise when I opened the December Newsletter yesterday to find our picture on the front cover! The diary is already filling up with events for next year. I have been invited to speak at the Hadlow College Careers Fair in February when lots of students attend to hear speakers from various farming sectors and will be putting together an exhibition stand for this - I did something similar for the College earlier this year and it was a great success. I also already have one booking for a W.I. talk and Jane (Cheesemakers of Canterbury) and I are both looking forward to the Weston A Price Foundation Wise Traditions Conference on 17/18 March 2012. This is always a fabulous event and next year will take place over 2 days in Epsom.